Access is relatively speedy from Pau and Toulouse airports (or Lourdes TGV for rail travellers) and the village is also a long-established spa destination with much retro charm. There’s plenty of accommodation in the town, which boasts high-speed gondola access to the ski terrain. Further up the valley is Pont d’Espagne, with downhill and cross-country skiing, walking, etc., in beautiful natural surroundings. Well-planned selection of groomed pistes. 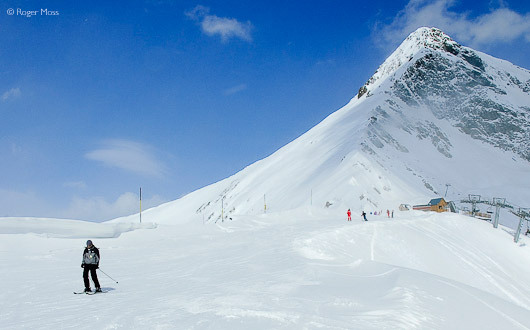 The family ski station of Cauterets is one of the most popular in the French Pyrénées. Its well-planned selection of groomed pistes is served by an efficient lift system and will appeal to recreational skiers looking for a relaxed (but not too relaxed) and uncomplicated experience. Although slightly limited in overall size, it has safe débutante and children’s areas. The rest is Blue- and Red-graded scenic cruising, with a few steeper Blacks. Cauterets has had an excellent snow record over the past few years. Finally, the presence nearby of Luz Ardiden expands the possibilities for anyone looking for more terrain and a worthwhile change of scenery. The beautiful, unspoilt Pont d’Espagne area offers a couple more downhill pistes, and is superb for cross-country skiers. It’s also the perfect setting for easy snow-shoe walks. Cauterets’ pleasant town centre has plenty of shops and cafés plus welcoming spa and wellbeing facilities to relax aching muscles. Apparently the old spa town has more visitor beds than any other tourist town in France - around 25,000, in fact. So there should be something for everyone, from traditional family hotels to renovated apartments. Evenings, while hardly riotous, are nevertheless engagingly convivial. 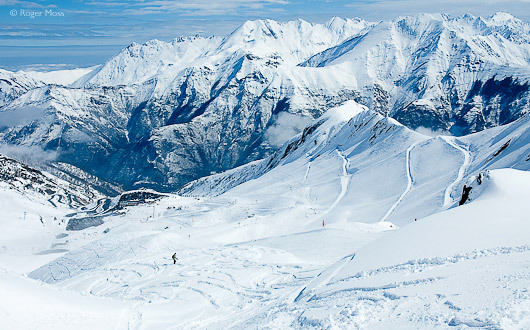 Why go skiing in Cauterets ? Families looking for good value skiing. The gondola from the town centre is really convenient and the beginner terrain is great for children. Intermediates will increase their confidence on the well groomed slopes. Experienced skiers, though, will find it limiting after a few days but could head over to nearby Luz Ardiden for a stimulating change of scene. Drop-off point just outside the Lys gondola loading area (adpated toilets) and ticket office. No adapted parking spaces. 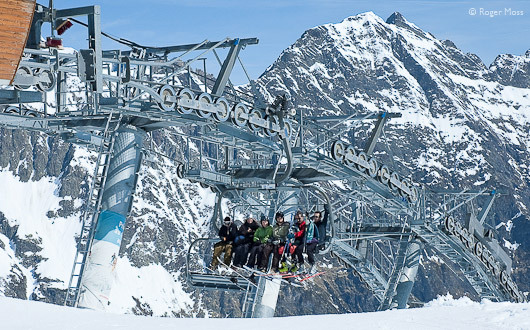 Direct access to the slopes from the Lys gondola. 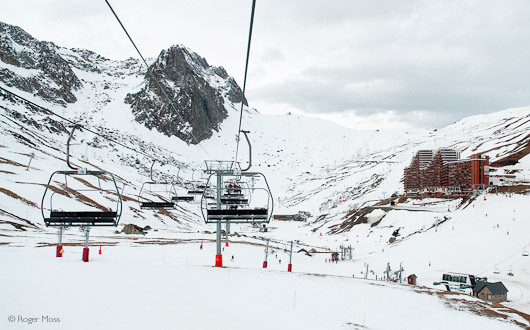 Grand Barbat and Crêtes chairlifts are accessible plus the beginners magic-carpet. Covered area, ESF, adapted toilets and snack bar all accessible, lift to restaurant and picnic room on first floor. Ski pass 100% free for a disabled skier (proof required) and 50% for a companion. Qualified specialist instructors and equipment at ESF and ESI. See Haute Pyrénées website for further details. Good value skiing and dining. Thermal spa centre Les Bains du Rocher. 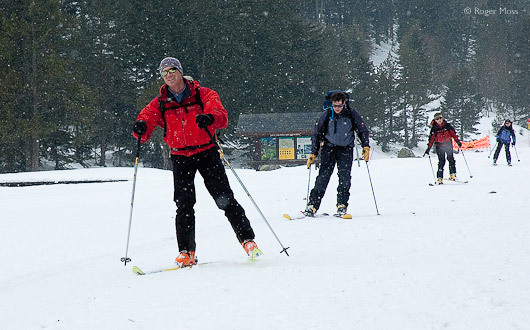 Visit Pont d’Espagne (7km from Cauterets) for cross-country ski and snowshoe trails, plus a few downhill runs. 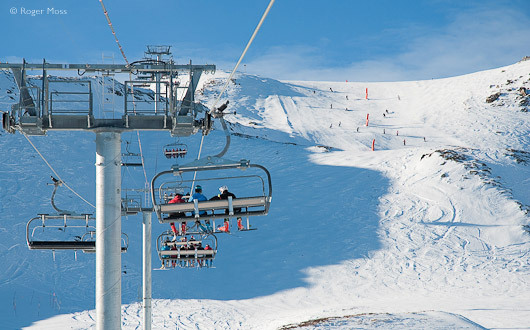 There’s a whole lot more skiing on offer nearby in Luz Ardiden, so make a point of getting to know it while you’re here. We've stayed at the conveniently located Hotel le Lion d'Or a couple of times and would highly recommend it (see review below). There are plenty of accommodation options in Cauterets including apartments and centrally located hotels, especially good for non-skiers who want to be close to the thermal spa. Lovely family-run hotel just minutes from the Lys gondola. 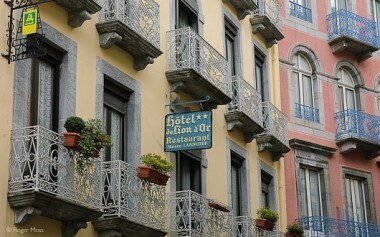 The hotel is noted for its charm and character and the recently renovated rooms have added extra comfort and style. We opted for half-board and enjoyed evening meals with plentiful home-cooked food. While serving an apéritif or after-dinner coffee at the hotel bar, the owners’ son was happy to offer advice about where to find the best skiing. A qualified ski instructor, his knowledge of the surrounding area proved invaluable. Naturally hot spa waters flow through both interior and exterior pools in this recently-developed spa and wellbeing centre in the heart of Cauterets. Inside a round pool contains a variety of relaxing water treatments with bubble beds, geysers, Jacuzzi and massage jets. Outside a stainless steel lagoon with relaxation beds has 2 Jacuzzis, bubble beds, and swimming against the current. People can also enjoy a sauna, hammam and very hot bath (38°C). We thought the pools were well-designed and felt very relaxing after taking advantage of all the treatments. We then headed upstairs and enjoyed a wonderful massage in the wellbeing centre. There’s a great locker system using a wrist band with a unique code, so no small coinage is required. There’s a wide range of good restaurants in town to choose from. One which has been getting rave reviews is the excellent En So de Bedau, run by the larger-than-life character and owner, David (look out for the large black beret and pictures of goats!). This little restaurant serves up a mouth-watering menu of some of the best regional foods in a friendly atmosphere and at great prices. A firm favourite, with real Pyrenean mountain food, is the excellent Les Trois Couronnes. The friendly owners serve a selection of both traditional fare and some more contemporary takes on classics, all in a cosy atmosphere. For a more upmarket eating experience (but one that doesn’t deplete the budget) you can try L’abri du Benquès located by a waterfall just out of town on the way up to Pont d’Espagne. This restaurant has a log fire inside, and serves a beautifully-presented menu of local specialities with a modern take. For a rustic, mountain experience and one that requires a walk (often in snow shoes) to reach, is the superb Reine Hortense. Overlooking the town up at 1500m, here the owner serves up hearty mountain food cooked on an open fire. Not great for vegetarians, but if you like real steaks, duck and delicious potatoes cooked in loads of garlic then the effort to reach it will repay the effort. For an après-ski drink enjoy a vin chaud at the Ski Bar in the town centre, either inside in the wooden alpine style bar or outside whilst watching the world go by. Hip skiers and boarders often go to the lively Café du Commerce after a day’s skiing to enjoy the music and buzzy atmosphere of this great little bar. Spend a day in the beautiful and remote Pont d’Espagne in the Parc National des Pyrénées. There’s some downhill skiing in a beautiful setting, but it’s perhaps even better appreciated with cross-country skis or snow-shoes. Opening times variable but it’s a welcome sight when you need a warming hot chocolate or a midday meal. Formerly used by spa patients to overpower the after-taste of the sulphurised water, the sweets have become a speciality in Cauterets, with countless flavours. There are four berlingot makers in the town and you’ll often see them making batches of the sweets. Naturally, you can also sample the results. Ryanair offers winter flights from London Stansted to Lourdes (just 30min from Cauterets). You can also fly into Pau (90km/1½hrs) or Toulouse-Blagnac (210km/2½hr). Take the Eurostar to Paris then Paris - Lourdes TGV. Transfer to your destination by an SNCF coach from the front of the station or book a hire car in advance. For many years Cauterets was known not as a ski resort but as a spa town. This, along with a slightly over-the-hill casino, still gives it a slightly genteel quality. But the town is on the up, with new construction integrating nicely with the old, as we observe while gliding slightly incongruously over the rooftops in the modern gondola lift, en-route to the ski terrain. It won’t be long until the season draws to a close, but the snow-line remains reassuringly low, and as we climb ever higher it becomes clear that conditions are indeed better than we’d dared to hope. The journey takes us to the 1850m mark, where we step out of our cosy Perspex bubble and into the now-familiar chill-factor of the Hautes-Pyrénées. As the sun slips behind the clouds we waste no time heading off to warm ourselves up on the run down the Sacca blue piste to the next lift, the Crètes six-seater detachable chair. From here virtually the whole of the ski terrain is laid before us like a giant three-dimensional piste-map, but without a fold in sight. The gondola passes over the rooftops of the town. 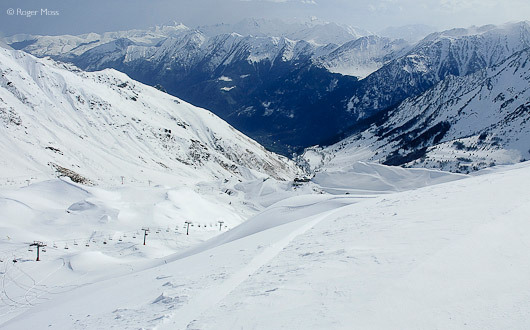 One of the higher blue pistes in the Cirque-du-Lys. The lift turns out to be a real flyer, hauling us smoothly above the rooftops of the town and up the mountainside to around 2300m. With little thermal-shock effect, we glide straight off and head down to our onward lift, the Brèches four-seater, for a ride up to 2415m. From here virtually the whole of the ski terrain is laid before us like a giant three-dimensional piste-map, but without a fold in sight. This is a defining feature of Cauterets: what you see is pretty much what there is, with few hidden corners tucked away to explore with a sense of going your own way. Over to our left we can see Touvarolles, another four-seater which is a particularly interesting lift as red pistes it serves offering the chance to rack up 640m of vertical drop in a single run. Sadly, though, the sector we’d been particularly looking forward to discovering turns out to be closed on this occasion due to steadily-increasing high winds. Instead we content ourselves with the generally more sheltered bowl which makes up the remainder of the ski area. 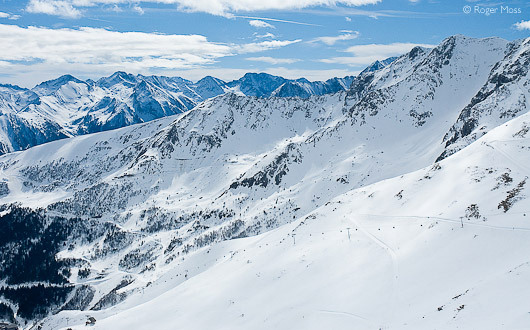 As the piste-map suggests, the scenic cruiser of choice proves to be the blue-graded Crètes, which provides even relatively timid skiers with a bracing top-of-the-mountain experience, complete with vast panoramic views. Along the way the run passes another three lifts plus clearly-signed departure points for a choice of blue, red and black runs dropping back down to the Cirque du Lys. We follow the main blue all the way, before climbing a few more times to enjoy a few of the variations set within the long, sweeping arc of our early run on Crètes. It’s clear that there’s a lot of enjoyment to be had like this, particularly for those who are still building their confidence before moving onto sterner tests. But we also get the feeling that there just might not be enough terrain on offer for more demanding skiers, who might be tempted elsewhere to satisfy their desire for fresh challenges. Cauterets and the view over the Pyrenees. Fortunately, the lift-pass also takes in a little more downhill terrain some 7km further up the valley at Pont d’Espagne (1450m). Here, in a hauntingly beautiful setting high in the Parc National des Pyrénées, we find another gondola designed to get even non-skiers into the heart of this otherwise remote spot. The downhill terrain at the far end is quite modest, but surprisingly is served by a pretty capable high-speed chairlift. At the top there’s a choice of red or blue-graded runs which wind their way back down through the silent pine forest. Sadly the lift is closed due to poor visibility during our visit, but since that’s down to steady snowfalls we’re happy to explore things on foot. We discover that Pont d’Espagne also has a couple of safer-than-safe débutante runs on the valley floor beside the welcoming Chalet Refuge du Clot, into which we eventually tumble in search of reviving chocolat-chaud.